Replacing your roof is a major job but also a worthwhile investment. 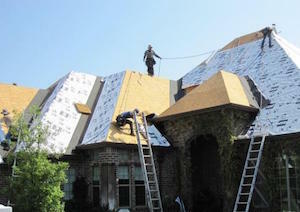 Oklahoma Strong Roofing & Construction are your local experts for complete roof replacement. We service a wide variety of roofing materials and give you a durable, affordable roof that will perfectly complement your home and last for years to come. Let us help you give your home a beautiful new roof that will keep you safe and dry. Call us today at 1-405-322-5333 or click below for a free estimate on total roof replacement or any of our roofing services! Get a Free Roof Replacement Quote Today! In this before & after set, we show you a metal roof that we converted to GAF Lifetime Shingles! In this before & after set, we show you a replacement where we remove 30 year stained shingles and replace them with New GAF Timberline shingles! In this before & after set, we show you a building that had its roof replaced with our hail impact shingles! Here is the back view of one of our replacement jobs. We also did new flashing on the bottom of the chimney, new pipe jacks and removed the four unnecessary turtle vents on the roof for better venting. Before we fixed up this roof, it was split into two halves, as in one side of the roof were all shingles, and the other half was metal paneling. What happened here was that when there was damage only to one side of the roof, it was "fixed" by placing a metal panel roof over the damaged shingles. We fixed the problem and gave it a beautiful face lift with some Tiger Paw shingles to match. Here is a simple roof replacement job out in Braman, Ok. We replaced our customer's shingles with a nice red shaded Tiger Paw shingle and painted all the pipes to blend in with the roof nicely. These folks are thrilled with the new roof and we love our happy customers! This rural home in Braman, Oklahoma needed the roof replaced. Oklahoma Strong Roofing & Construction replaced the shingle roof, and now the homeowners can have peace of mind for years to come. "Very good! Fast, courteous, and thorough! Was not an easy roof but they..."
"They have been very attentive to meeting our needs and keeping us very..."
They have been very attentive to meeting our needs and keeping us very much informed on the progress of whatever work they were doing. Call Oklahoma Strong Roofing & Construction today if your roof is displaying these signs. Our expert roof inspection can tell you if you need a full replacement or if repair and maintenance is a better option for your home. Awesome job. Fast and professional. Oklahoma Strong got my roof completed quickly, what seemed like overnight. They got the job done fairly quietly and left my yard looking like it did when they arrived. I was very pleased with how everything turned out. I love my paint color! I have to give Oklahoma Strong props on finding more damage on my second inspection when another company couldn’t find enough. They found that my roof was 75% damaged and got my insurance to pay for my new roof. I appreciate Oklahoma Strong for helping me get it done. I think my roof looks great! I love the color of my new roof, and the crew worked very hard with very quick clean up. I appreciate Oklahoma Strong! Brad was very pleasant to work with. His crew did an excellent job. Brad handled everything. Work was done ahead of schedule. He was right on time and made a very good presentation. All people involved in the roof replacement did a very good job. I would use them again. The best part about Oklahoma Strong is that they provided every type of service we required! Brad, the crew, the process, and final result was great! The crew was very hard working and did outstanding clean up. I was impressed that the guys took off our shingles in one day on our three buildings. If you think it might be time to have your roof replaced, contact Oklahoma Strong Roofing & Construction today to have your roof inspected by one of our experts. We proudly serve in Edmond, Oklahoma City, Yukon, Piedmont, Newcastle, Choctaw, Blanchard, Tuttle, Harrah, Arcadia, and throughout the surrounding areas. Get a FREE Roof Replacement Quote Now!